Four keys to the Women's Final Four, in which UConn will face Oregon State and Syracuse will meet Washington. Here are four keys to the national semifinals, in which No. 1 seed and three-time defending champion UConn (36-0) will face No. 2 seed Oregon State (32-4)—which upset Baylor to reach its first Final Four in program history—and Syracuse (29-7) will meet Washington (26-10) in a matchup of first-time Final Four participants. Stewart (19.3 PPG, 8.7 RPG, 123 blocks, 58.3% FG) is going for her fourth Most Outstanding Player award, an unprecedented run in the women’s and men’s NCAA tournament. She’s a matchup problem for every team Connecticut faces because she can shoot, drive and post up. She has a high shot release point, and her 7’1” wingspan allows her to stretch around defenders in the paint. She’ll likely be guarded by a combination of Deven Hunter, an athletic forward, and Gabby Hanson, a strong perimeter defender with superior lateral quickness. On the other side is Oregon State’s Jamie Weisner, the Pac-12 player of the year and a second-team All-American. Terrific off screens and in the midrange game, Weisner is also the best rebounding guard in her conference, and keeps lots of plays alive with offensive boards and tip-outs. She scored 38 points in the Beavers’ Sweet 16 win over DePaul, but struggled against Baylor’s length in the Elite Eight, finishing with 16 points (on 5-of-14 shooting) and seven turnovers in the Beavers’ win. How do role players respond to the big stage? Certainly the Big Three for each team—Stewart, Moriah Jefferson and Morgan Tuck for UConn; Weisner, Ruth Hamblin and Sydney Wiese for OSU—played critical roles in getting their respective teams to Indianapolis. But to advance to the title game, everyone will need to contribute. 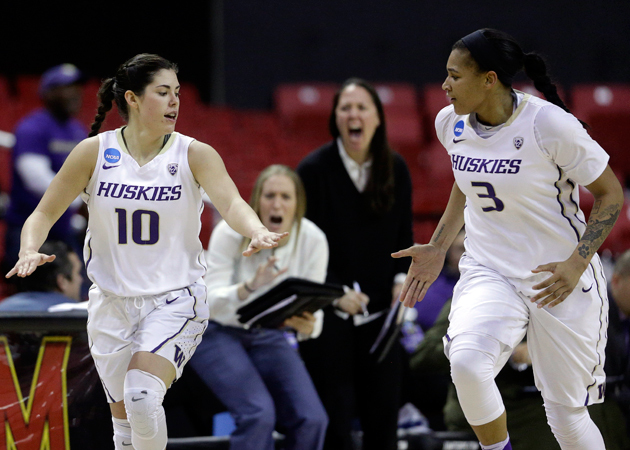 Against Texas in the Elite Eight, the Huskies got big-time minutes from two freshmen: Katie Lou Samuelson (nine points on 3-of-6 three-point shooting and six rebounds) and Napheesa Collier (nine points on 4-of-4 shooting and four rebounds). They didn’t play like newcomers and that has to continue in Indianapolis. Oregon State, meanwhile, got scoring punch from starting guard Hanson, who chipped in 10 points against Baylor. Hanson has often gone missing offensively in big games, but her baseline jumper with 3:28 to play against the Bears, which broke a 55-55 tie, might have been the biggest shot of the game. Oregon State will need points from her, and Hunter, and at least one person off the bench—probably 6’5” post Marie Gulich—to pull off what would arguably be the biggest upset in women’s tournament history. Which team shoots the other one out of a zone first? Long live the 2-3 zone, which helped each of these Cinderellas dance all the way to April. Part of the reason it works well for the Orange and UW is that so many teams don’t have good zone offenses that can truly penetrate gaps and create open looks. It helps to have toughness inside, too: Washington’s Chantel Osahor, the MVP of the Lexington Regional, is known for her flat-footed three pointer but she’s underrated as a defender and does a particularly good job protecting the paint while avoiding getting whistled for fouls. The best way to get someone out of a zone, of course, is to shoot it, and these teams love to do that, too. Led by guards Alexis Peterson (16.1 PPG, 41.7% FG) and Brianna Butler (13.6 PPG, 31.2% 3pt FG) Syracuse makes 8.9 threes a game, 11th-best in the country. Butler has attempted 368 threes this season, the most in the nation, and her 124 makes rank second (two players have made 126). Washington connects on 7.2 per game (33.7%), and the 6’2 Talia Walton, 6’2 Osahor and 6’3 Katie Collier are not afraid to launch the ball beyond the arc. But shooting will be only one of several factors that decides this game. Which team will give up more offensive boards and second chance points? Syracuse averages 17 offensive rebounds per game, which is fourth best in the country; Washington grabs just under 10 a game, but typically gives up 12. How will the Orange guard Kelsey Plum? Outside of UConn’s Stewart, the 5’8” Plum (26.2 PPG, 4.2 APG) is the best one-on-one player in Indianapolis. She can shoot from everywhere, is excellent off the dribble and knows exactly where her teammates are going to be when she has to kick to them. She gives every team fits. Plum is an underrated distributor, and can hand out assists most of the night while she waits to heat up, like she did in the Elite Eight win over Stanford. She’s also great at getting to the line (typically challenging to do against zone), where she shoots 88.7%. Will Syracuse box-and-one her, as they did for stretches against Tennessee’s Diamond DeShields, a dynamic guard who took 21 shots on her way to 20 points? Will they trap Plum on the catch and try to force the ball out of her hands? Will Syracuse’s defense rattle her? The Orange force more turnovers than anyone in the country (24.2), and against UW on Nov. 27, the Huskies threw the ball away 19 times and fell behind 21 points before clawing back but eventually losing 66-62. Washington coach Mike Neighbors’ memory of that game: “They really dominated us.” Will this go-round be different?